Zimbabwe's opposition leader briefly emerged from the Dutch Embassy Wednesday to urge African leaders to guide talks to end the country's political crisis, while Nelson Mandela called the situation "tragic." Morgan Tsvangirai, leader of the main opposition party in Zimbabwe, prepares for a broadcast at a press conference in Harare Wednesday. ((Tsvangirayi Mukwazhi/Associated Press))Zimbabwe opposition leader Morgan Tsvangirai briefly emerged from the Dutch Embassy Wednesday to urge African leaders to guide talks to end the country's political crisis as his supporters sought refuge at the South African Embassy. A spokesman for the South African Foreign Ministry said the ambassador is talking with the group, believed to number around 300, and that the situation is under control. Later in the day, former South African president Nelson Mandela broke a long silence on the crisis, telling a banquet in London that there was a "tragic failure of leadership" in Zimbabwe. Critics had called on Mandela to use his moral stature in Africa and speak out about the Mugabe government's tactics against the opposition. 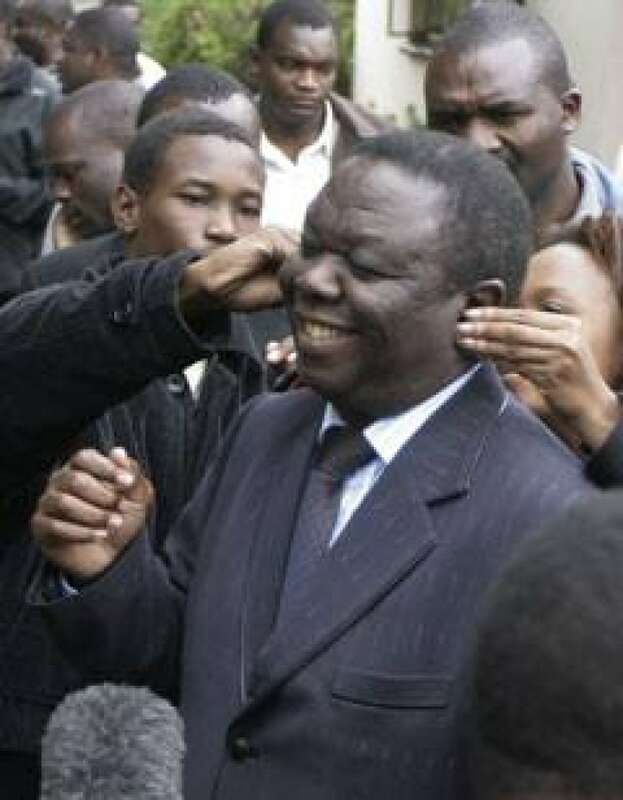 During his appearance in Harare, Tsvangirai, looking relaxed, told reporters that Friday's scheduled presidential run-off election is not the solution, repeating his assertion that it would not be free or fair. Instead, he said, African leaders must come together for discussions aimed at creating a coalition transitional authority for the country. "What is important is that both parties must realize the country is burning and the only way is to sit down and find a way out of it," said Tsvangirai. But the Movement for Democratic Change leader said talks cannot begin until state-sponsored attacks on his supporters stop and political prisoners, such as his second in command Tendai Biti, are freed. A government minister responded with derision to Tsvangirai's statement and reiterated that President Robert Mugabe's ZANU-PF party is focused on the election. "Is he out of his mind?" said Deputy Information Minister Bright Matonga, adding that Tsvangirai's name will remain on Friday's ballot because his withdrawal came too late to be valid. Tsvangirai pulled out of the race on Sunday, saying he feared for his life. Scores of his supporters have been attacked and killed in recent weeks by police, soldiers and militant members of the ruling party. The opposition leader sought shelter and safety at the embassy on Sunday after getting a tip soldiers were headed to his home. Also Wednesday, opposition officials said police raided one of their provincial offices. The Movement for Democratic Change party has already been coping with arrests of key members, including the party's second in command, Biti, who is jailed on treason charges. In the face of growing international condemnation, Zimbabwean President Robert Mugabe has fiercely defended the June 27 run-off election, saying the world can "shout as loud as they like," but he won't bow to pressure to call off the race. "We will proceed with our election, the verdict is our verdict. Other people can say what they want, but the elections are ours. 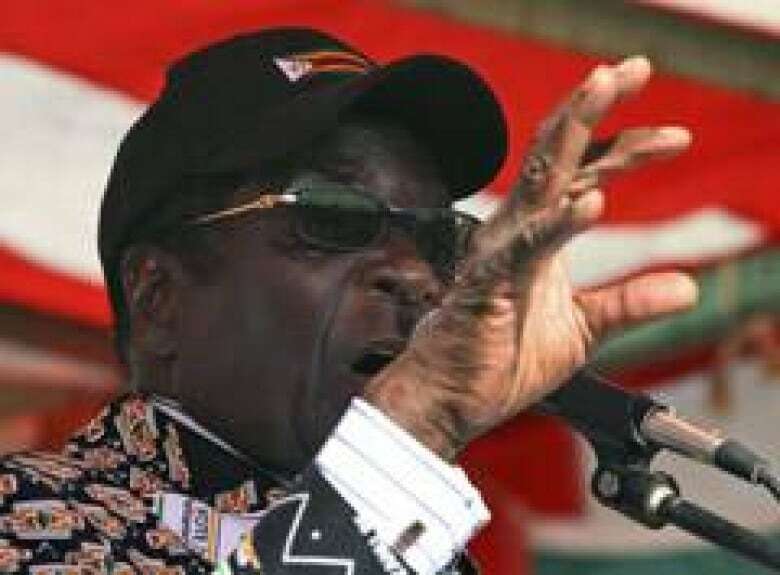 We are a sovereign state, and that is it," Mugabe said on Tuesday as he continued campaigning. "They can shout as loud as they like from Washington or from London, or from any other quarter. Our people, only our people, will decide, and no one else," the 84-year-old leader said. U.S. officials told BBC News Wednesday that they will not recognize the outcome of Friday's vote, while British Prime Minister Gordon Brown vowed to push for new European Union sanctions against the country. Brown also said Britain will ban Zimbabwe's cricket team from touring Britain next year. Queen Elizabeth II also stripped Mugabe of his knighthood. Regional heads of state were meeting Wednesday in Swaziland to discuss solutions for Zimbabwe, but South African President Thabo Mbeki, a mediator in the dispute, will not attend. Mbeki has refused to publicly denounce Mugabe, even as other African leaders step up their criticism, saying confrontation could backfire. Mediation efforts appear aimed at bringing Mugabe and Tsvangirai together in a coalition government. Tsvangirai won the first round of the presidential election on March 29, but did not secure an outright majority, opening the door to a run-off vote.